Pubs, restaurants and hotels could share £20m in refunds after winning a court battle over the charges they pay for playing recorded music. The High Court upheld a ruling from a copyright tribunal that the tariffs introduced in 2005 were unfair. The Institute of Licensing claimed the charges meant fees were increased by more than four times. Phonographic Performance Limited, which represents record companies and performers, brought in the charges. Organisations including the British Beer and Pub Association (BBPA) and the British Hospitality Association (BHA) took the case to the tribunal. BBPA chief executive Brigid Simmonds said: "This judgment confirms the victory won last November, and is another milestone which brings a step closer the prospect of substantial and fully justified refunds for pubs. 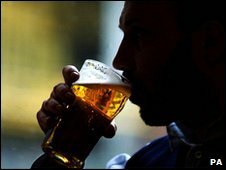 "This could not come at a more important time for our sector as we struggle to come out of recession and will allow pubs to both claim a refund and pay less going forward. "With so much at stake, our persistence in pursuing this case has paid off. "With the appeal behind us, and pubs already benefiting from the sharply reduced charges, we are now turning our attention to helping pubs to claim the long overdue refunds to which they are entitled." Many pubs and restaurants play CDs as background music and - as this is classed as playing music to an audience - they are subject to the PPL charges. These aim to reward songwriters and performers whenever their work is broadcast. Phonographic Performance Limited (PPL), which acts on behalf of 4,400 record companies and 47,000 performers, said it was "extremely disappointed" at the decision. A spokesman said: "This leaves PPL with tariffs that it believes substantially undervalue the rights of its performer and record company members."